You might have a real pantry with lots of shelves for storage or a few cupboards that serve as your pantry. Whatever you happen to have, these areas of the kitchen often get super cluttered with daily use. Trying to keep the shelves neat and organized can be a daunting task. YouTuber Ash Jackson decided to tackle this challenge and share the results with her viewers. She buys most of her containers at Kmart and IKEA, but you can get creative and use similar containers you have around the house. The finished product is a pantry you'll be proud to show off. Tip 1: Use clear, labeled jars instead of individual packaging boxes. The jumble of soft packages for items like flour, sugar and rice can make an unsightly mess. You can clean up the pantry by placing these items in jars. Printing a label for each jar ensures that you won't forget what each one contains. 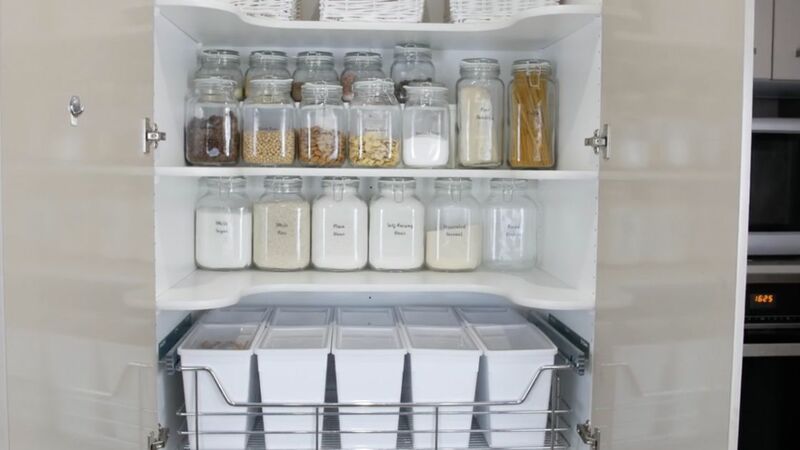 Tip 2: Use shelf inserts to maximize shelf space and keep small jars in sight. 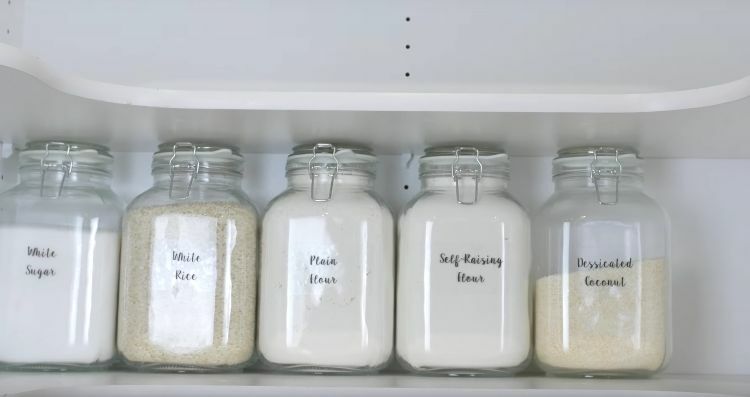 Since you don't need a large jar for every item, you can use smaller jars and maximize your shelf space by buying shelf inserts. These create minishelves so that you can stack up more items in your cupboard and keep from wasting space. 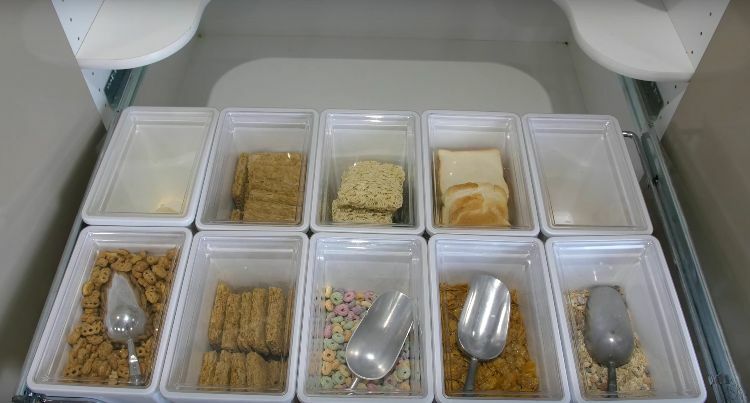 Tip 3: Set up large containers with ice scoops in them for an easy, organized, self-serve snack drawer. For families who need to pack snacks for the kids, having a drawer dedicated to snacks saves both time and space. To make the packing go faster, place an ice scoop in each container. When you need to pack, simply open the container, grab the scoop, fill the baggie and go. 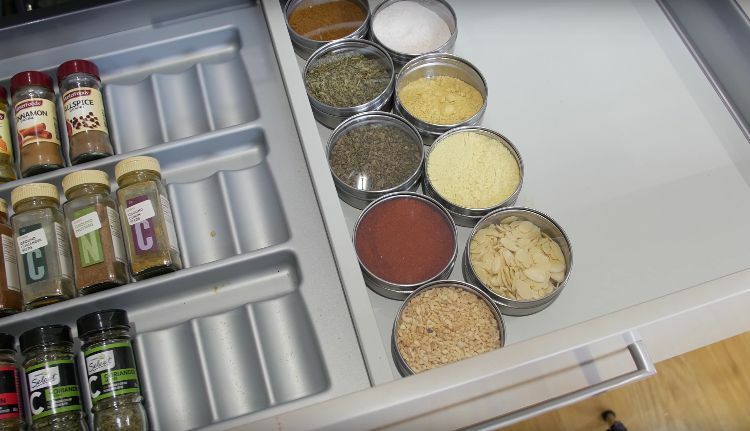 Tip 4: Use clear magnetized containers to keep spices organized and prevent them from rolling around. 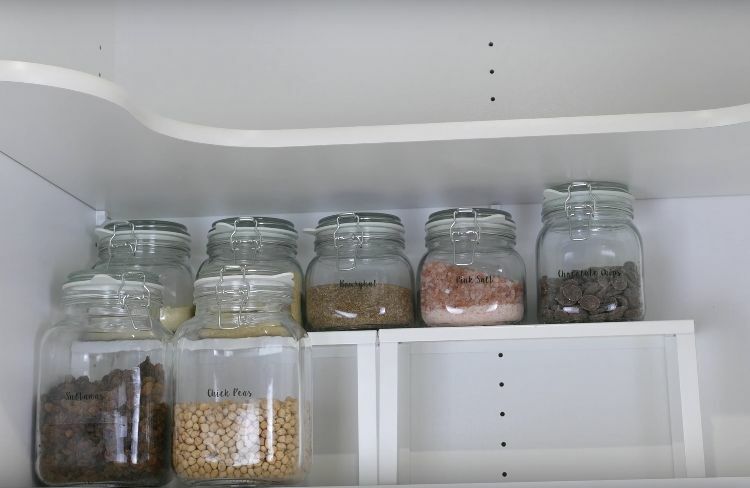 IKEA's Grundtal containers are magnetic and make great storage containers for spices and smaller items. The magnets on the back make them perfect for hanging on refrigerators or magnetic strips on the backs of doors. To see everything that Jackson recommends, watch her step-by-step video — and make sure to also check out her family's YouTube vlog while you're at it. With a little bit of effort and imagination, you can have the same kind of pantry. If you liked this article, be sure to share it! The kitchen is one of the rooms that can easily become a mess, more if we're talking about smaller houses. Maximizing the space you have couldn't be simpler thanks to these efficient, yet gorgeous hacks, tips, and ideas.